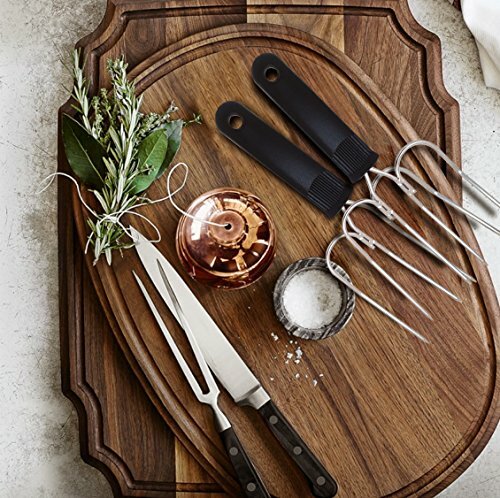 For me when I am carving my Turkey at Thanksgiving or other large cuts of meat for the rest of the year I wouldn’t use anything other than a cutting board with spikes. I like to have whatever I am cutting safe and secure so I can slice it up with my electric knife easily and safely. I also don’t want it to slide off the board or platter and end up on the floor. Its never happened to me but there were a few close calls before I got a spiked board. For those of you who haven’t carved a turkey before, want a few tips or to make sure you are doing it efficiently this video is worth a look. So what we are going to look at in this article is the choices available for meat cutting boards with spikes. 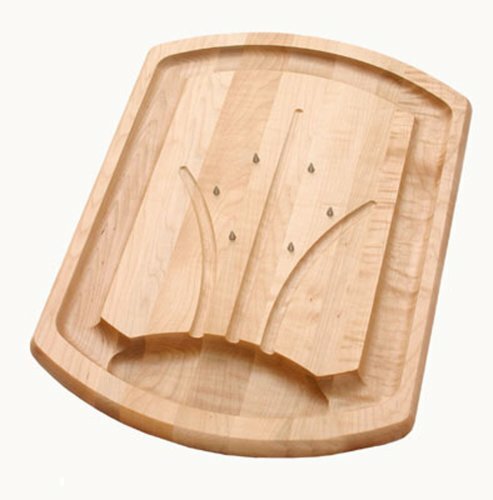 If you have been in the market for a quality cutting board before then you are likely to have heard of John Boos who are one of the brand leaders for this type of product. 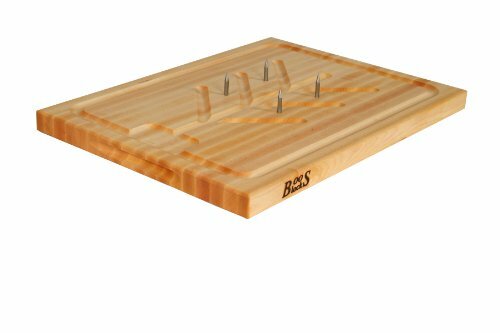 They have a wide range of different chopping boards but I believe this is the only cutting board with spikes in their range. This is really big in size so make sure that you have space for it or at least somewhere to store it away. Even if you aren’t the best at carving a turkey at least the spikes will keep it in place for you! 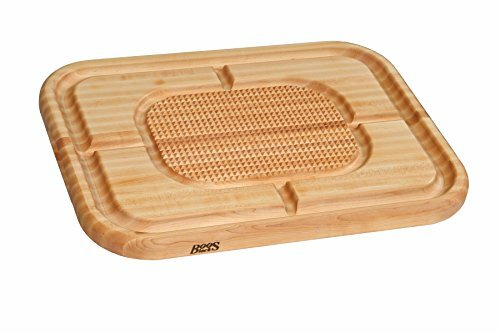 J.K Adams is another popular brand for chopping blocks, boards, and other quality kitchen products. 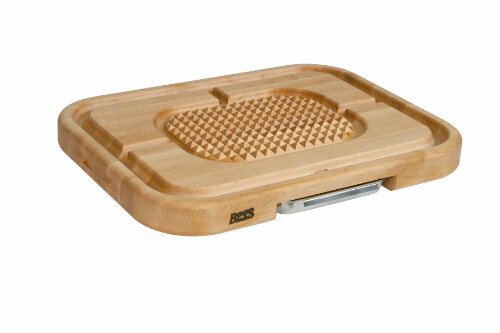 This is one of the most reviewed spiked cutting boards on Amazon. If you are looking for a US brand this one might be the one you are looking for as they are handcrafted in Vermont. Well constructed and heavy this will be a board you can pass down to younger members of your family. One reviewer mentioned having their board for 20 years already. The board holds in place the turkey or whatever meat you are carving and the juices flow to the grooves on the side resulting in no overflow. It comes with a lifetime warranty and is Handcrafted in New England USA. This is the budget option and if you prefer stainless steel over wood could be a better choice. This one has 5 spikes to hold the meat in place. This one goes out of stock easily so make sure that you place your order quickly if you want it ready for Thanksgiving. Snow River give you a choice of Walnut or Cherry wood for their board. This one deviates from our other picks in that it has a spiked ring in the center of the board. The board is reversible and the ring is also removable which makes it easier to store and clean as well. Make sure that you put the ring away safe as you don’t want to be hunting for it on the day. If you didn’t rate our first John Boos pick then this one might be more your style and rather than metal spikes comes with rows of small pyramids that will hold your meat in place instead. 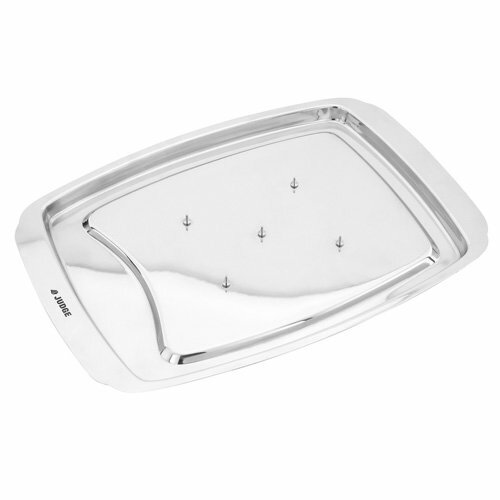 This one is our top of the range pick and has a price to match but it looks fantastic. 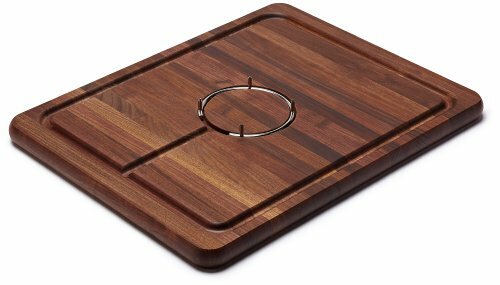 As well as the beautiful design this one is extra large with a juice tray and if looked after will likely be the last cutting board you ever buy. This one will wow your friends and family and be a talking piece of your kitchen. I’d really recommend investing in some turkey lifting forks to make life much simpler when moving your turkey from the roasting pan on to your cutting board. One less accident that is going to happen! 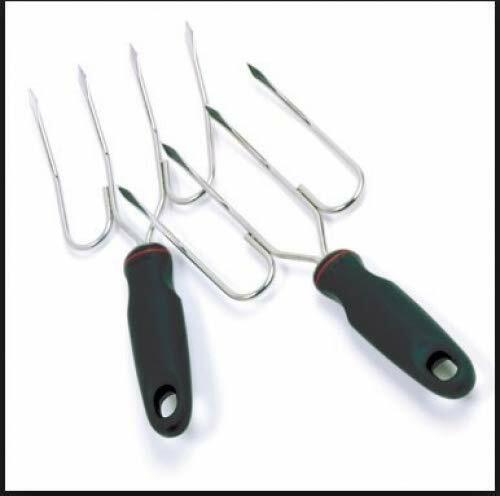 Easily maneuver your turkey without any accidents with these versatile turkey lifters that won't break or bend on you. 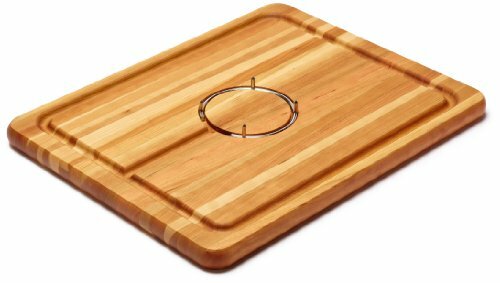 While there are hundreds of choices to make when it comes buying a cutting or chopping board for your kitchen to me it makes perfect sense to buy a cutting board with spikes rather than one without. My three essentials for a successful and accident-free Thanksgiving or Christmas are a spiked cutting board,heat resistant gloves, and some Turkey forks. I’d love to hear your tips for a Hassle Free Holiday.